There are myriad ways one might celebrate today’s holiday in honor of Martin Luther King, Jr. On my Facebook page, for example, I suggested we learn about—or recall—the other remarkable leaders of the civil rights movement, some of whom were mentors to King and others of his generation, establishing institutions and informal communication networks that served as the socio-cultural and political seedbed for the germination and later flourishing of the civil rights movement. I mentioned in particular such individuals as Bob (Robert Parris) Moses, Ella Josephine Baker, and Fannie Lou Hamer, among those ably introduced in Robert Payne’s brilliant book, I’ve Got the Light of Freedom: The Organizing Tradition and the Mississippi Freedom Struggle (1995). I also had the impudence to ask that we take time to recall the life and work of Malcolm X as well, recommending Eugene Victor Wolfenstein’s Malcolm X and the Black Revolution (1981). Indeed, there’s a work that offers a provocative comparison of the lives and ideas of Malcolm X and King, James Cone’s Martin & Malcolm & America: A Dream or a Nightmare (1991). Alas, both the prize-winning biographer of Fannie Lou Hamer, the historian Kay Mills, and the (post)Freudo-Marxist social theorist and psychoanalyst Wolfenstein, recently passed away. Here I thought I’d do something different and share a few passages from Simone de Beauvoir’s (1908-1986) journal that detailed her thoughts and feelings upon venturing into Harlem during a visit to America. 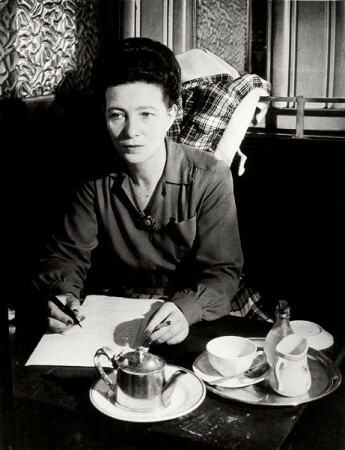 Beauvoir came to the States in January of 1947, keeping a fairly “detailed diary of her observations which was published in France in 1948 as L’Amérique au jour le jour” and to little notice several years later in England, and in English, as America Day by Day. The book was published (by the University of California Press) yet again with a new translation by Carol Cosman in 1999 and an inviting foreword by one of our nation’s best and more prolific historians, Douglas Brinkley (which first appeared in the New York Times Book Review in 1996). Beauvoir was by now a well-known existentialist philosopher and writer with a public identity as a cosmopolitan French intellectual tied to yet distinct from her lifelong companion, Jean-Paul Sartre. She is also rightly regarded as one of the seminal theorists of contemporary feminism.